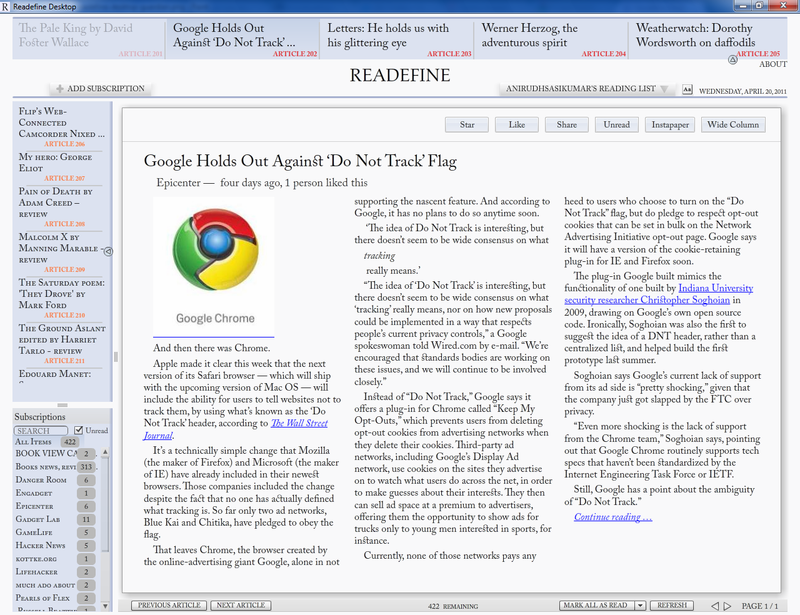 Update: Readefine 2.0 has magazine layout, Google Reader and instapaper support! I spend a lot of time reading articles on the web. Somehow, I miss the lack of typesetting and pagination especially when the article is captivating as well as long. This is my attempt at making reading content on the web (and the computer to a certain extent) more beautiful. 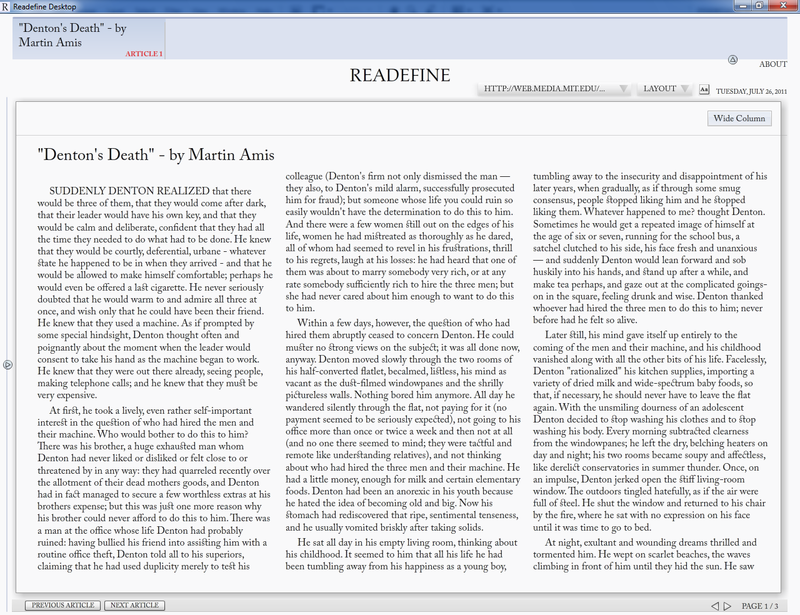 With a lot of help from Flex 4, Readefine beautifies text, RSS and HTML content for easier reading. Text is laid out in multiple columns, sanitized of stray newlines and paragraphs and a nice font is applied. It can load content from the web, a file on your computer or via copy-and-paste. 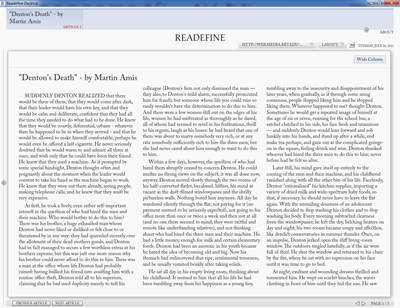 Readefine supports content in RSS, HTML or plain text format. Text settings like justification, ligatures, column width / count, etc. can be fully customized and saved. 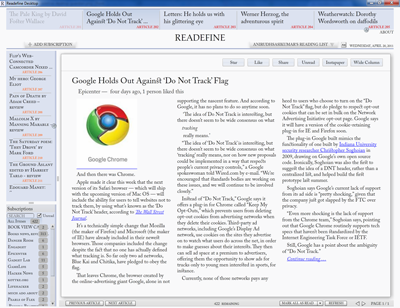 Newspaper like layout for RSS - my aim was for RSS files to look like a newspaper1. Paginates rather than supporting scrolling. I hate scrolling while reading a lot of text. Remembers the last 30 URLs you have visited. Resizes images to fit within the columns. Tries to compute the absolute URL from a relative link. HTML support is experimental. Certain HTML (even from popular sites like the Wall Street Journal) will make it go crazy. Plain text and RSS work best. This is my first full-fledged Flex 4 application. Flex 4 rocks! The components used in this extend the existing Flex 4 and Text Layout Framework classes to add pagination, HTML cleanup and tolerant HTML import. I've also built a Scroller like component for the overflow of articles from top DataGroup to the one on the left side. Try it out and let me know. Any feedback is welcome. Though I don't know how far I have achieved that goal. Copyright © 2004-2008 Anirudh Sasikumar. All rights reserved.